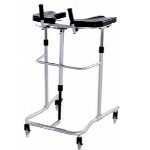 The SafetySure™ Pivot Disc will give you major assistance when transferring, lifting or moving an individual from one place to another. Save your back! Many Caregivers experience back pain and strain from lifting or assisting people while transferring them from their bed to a wheelchair, or from their wheelchair to the commode. This easy to use device will provide you that extra edge during the transfer. 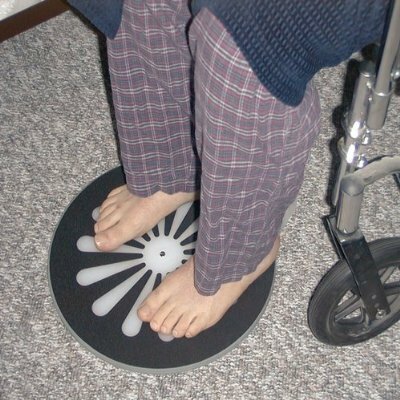 Imagine, with the feet of the individual firmly on the disc, the individual can be rotated to be in position to sit in their wheelchair, or down on the bed from their wheelchair. You will find the pivot disc lightweight, easy to use and to carry with a built in handle grip. 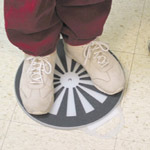 To use, the Caregiver "locks" the disc into place by stepping onto the disc after the individual's feet are firmly in place. Using a transfer belt during the transfer process will make it easier and safer. The pivot disc is suitable for any type of transfer. Portable - weighs only two pounds. The pivot disc is constructed of three high quality polymer plates, each turning on top of the other. Anti-glide tape is adhered to the top surface (where individual will place his/her feet) to prevent slipping even in socks. Note: Contains natural rubber which may cause allergic reactions.